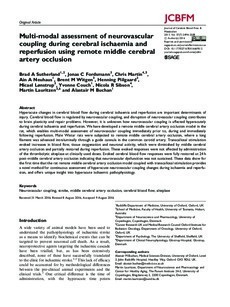 Hyperacute changes in cerebral blood flow during cerebral ischaemia and reperfusion are important determinants of injury. Cerebral blood flow is regulated by neurovascular coupling, and disruption of neurovascular coupling contributes to brain plasticity and repair problems. However, it is unknown how neurovascular coupling is affected hyperacutely during cerebral ischaemia and reperfusion. We have developed a remote middle cerebral artery occlusion model in the rat, which enables multi-modal assessment of neurovascular coupling immediately prior to, during and immediately following reperfusion. Male Wistar rats were subjected to remote middle cerebral artery occlusion, where a long filament was advanced intraluminally through a guide cannula in the common carotid artery. Transcallosal stimulation evoked increases in blood flow, tissue oxygenation and neuronal activity, which were diminished by middle cerebral artery occlusion and partially restored during reperfusion. These evoked responses were not affected by administration of the thrombolytic alteplase at clinically used doses. Evoked cerebral blood flow responses were fully restored at 24 h post–middle cerebral artery occlusion indicating that neurovascular dysfunction was not sustained. These data show for the first time that the rat remote middle cerebral artery occlusion model coupled with transcallosal stimulation provides a novel method for continuous assessment of hyperacute neurovascular coupling changes during ischaemia and reperfusion, and offers unique insight into hyperacute ischaemic pathophysiology.